Despite its humble power output and underappreciated brand, the Mazda MX-5 is something special. After more than 20 years in production it remains the go-to sports car for those of us who earn less in a year than a Premiership footballer does in a week – its combination of style and affordability and that ensures its success year after year. There’s a multi-part solid roof that intricately folds away in a swift movement that David Beckham would have been proud of. It’s no fashion showpiece though, as the engineering under that sharp skin is top notch. Fitted with a choice of either a 1.5-litre or 2.0-litre engine, buyers can choose between a softer, gentler ride that allows extraction of maximum performance with ease, or a harder, faster, more demanding experience that rewards the brave but won’t frighten the timid. For real wind-in-the-hair motoring, the roof can be thrown backwards in an instant. There’s no complex and heavy motor to put the roof up and down for you, keeping the MX-5 as pure as the driven snow. 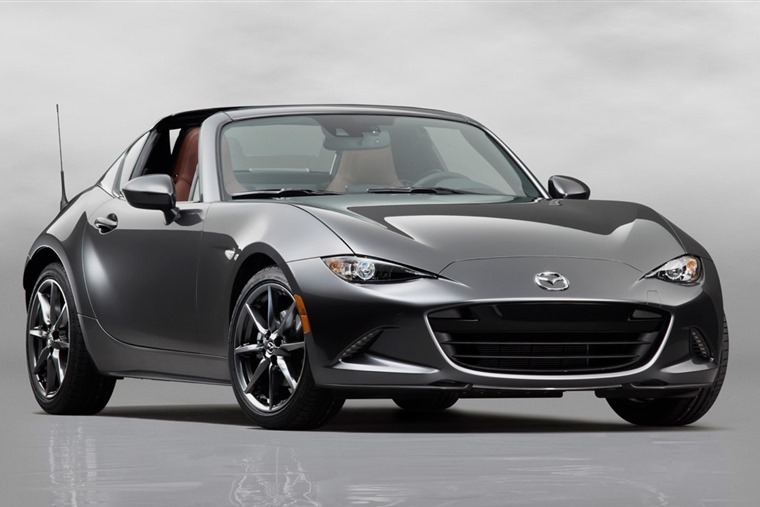 That all changes with this, the MX-5 RF. Instead of that quick-throw fabric roof, there’s a multi-part solid roof that intricately folds away in a swift movement that David Beckham would have been proud of. What remains is a pair of flying buttresses, reminiscent of those on the old Jaguar XJ-S, but not quite so elegant. It’s all quite complex, so those pesky motoras have been introduced to do all the hard work for you, adding around 50kg to the weight of the MX-5. The handling, despite the changes and that extra weight, still pleases. That weight means that there have been some very minor changes to the suspensions, with stiffer dampers and a revised roll bar. Surprisingly, Mazda has weakened a cross member under the car – that sounds alarming but it doesn’t alter the strength of the car. It does however change the rigidity of it, something that needed doing once the roof was found to make the car more solid. That then changed the handling bias, and so what is normally a good thing has had to be changed to ensure the MX-5 remained beautifully neutral at the limit. It could be argued that the MX-5 is about enjoying things at a more leisurely pace though, and that’s where it shines. 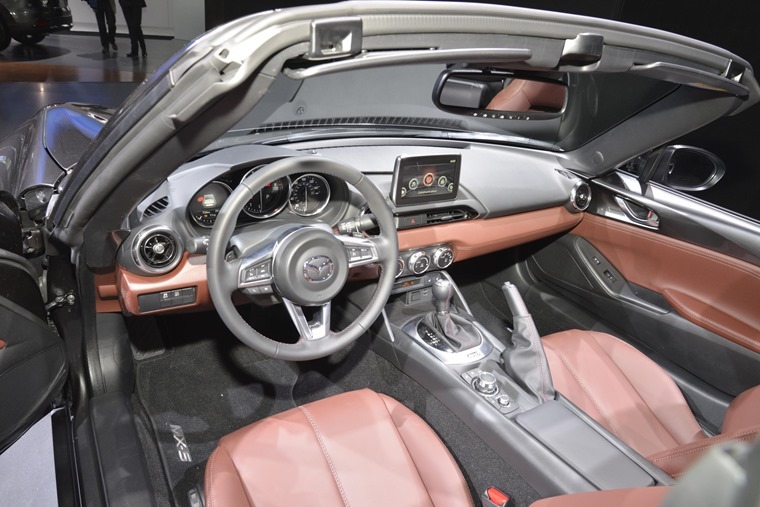 All of this means that the MX-5 RF still feels like an MX-5, just one that’s marginally compromised. That extra weight adds just 0.1 seconds to the 0-62mph sprint, but somehow it feels a little more lethargic than previously. Suspension changes or not, perhaps that extra weight high up on the car is making a bigger difference than we’re being told about. The roof itself isn’t quite perfect either. 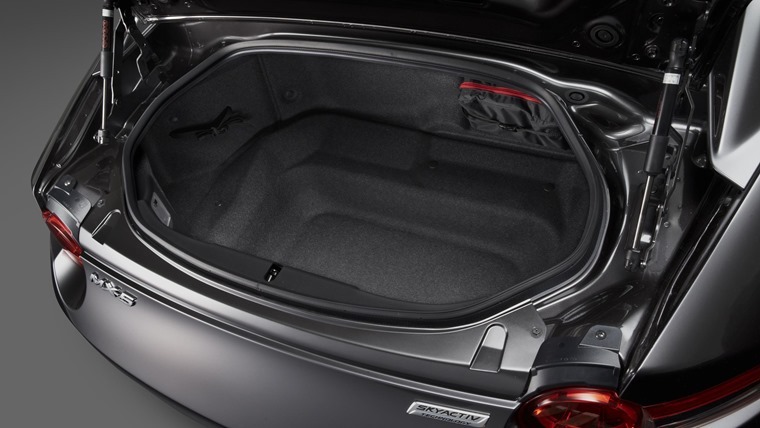 It folds away into a bucket behind the seats where, impressively, it doesn’t interfere with anything in the boot. When you press the button to raise it – something that takes 13 seconds and can only be done when stationary or below a brisk walking pace – bits pop up and twist and turn until it clicks automatically into place. There’s no doubting it offers more refinement than the fabric roof of the normal car, but there’s an irritating whistle from the passenger side at speeds over 30mph which refused to go away. It wasn’t confined to just one car either, as others had the same frustrating noise. The RF isn’t really meant to be driven with the roof up though is it? Is any convertible? Put the roof down and you get that open air sensation, but those rear buttresses protect you from swirling winds to a point. Start cranking up the speed and it can’t move the air away quickly enough, leading to a mind-numbing drone right behind your ears. Hood up or down, on the motorway you’ll get tired of the noise very quickly. Even at low speeds, you feel like a driving god. It could be argued that the MX-5 is about enjoying things at a more leisurely pace though, and that’s where it shines. The handling, despite the changes and that extra weight, still pleases. The steering is precise and directs a pointy front end to dart to the apex of a corner on command. The softish suspension allows mid-corner bumps to be absorbed without upsetting the prescribed line, while the back end can be encouraged to drift out gently. Even at low speeds, you feel like a driving god. 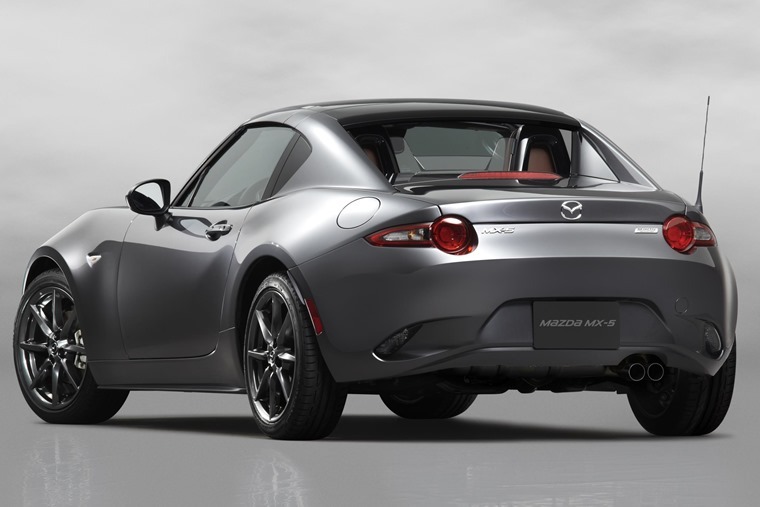 Everything else remains very much an MX-5, too. That means you’ve got a well specified cabin that includes satellite navigation, climate control, a seven-inch infotainment screen, DAB radio and all the normal electronic wizardry you would expect. Parking sensors aren’t standard at the entry level though so, with rear visibility hindered by those buttresses, that’s something to tick on the options list. 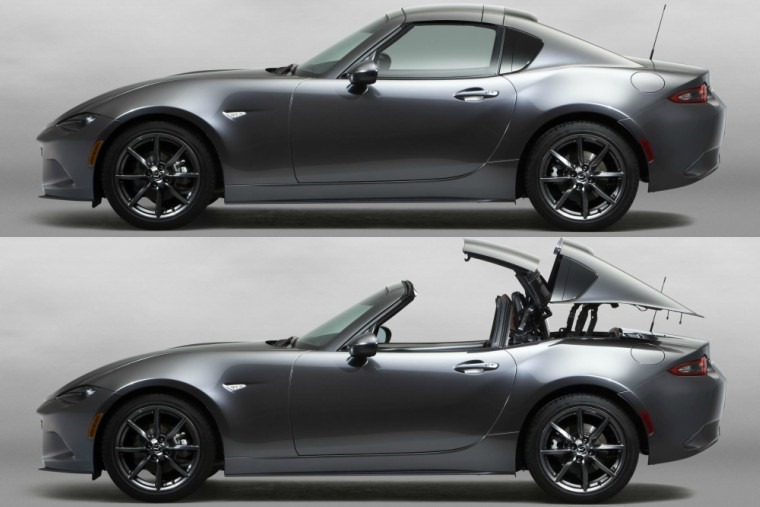 Of course, the other options would be to save the £2,000 premium the RF will cost over the normal MX-5 and throw back that roof yourself. Truth be told, that’s probably the best bet.